I always feel a little bit guilty when I follow a critic’s recommendation when choosing a wine to buy. Shouldn’t I know enough by now to make an informed decision all of my own? Shouldn’t I experiment, rather than taking the safe option of snaffling a wine I know – or someone I trust knows, or someone lots of people trust but I have no firm opinion of – to be good? But if buying a wine because a critic likes it is bad, making an independent decision to buy a wine which a critic then declares to be excellent is good. It’s all about the timing. And this satisfaction has never been so rapidly delivered than it was last month, when on the evening of December 6 I placed an order with the Wine Society for a variety of cheapish wines, and on December 7 Jancis Robinson, doyen of British wine writing, chose one of them as her wine of the week. This week I finally got round to opening one, and found it … well … extremely characterless. It was perhaps a little cold, and I certainly didn’t hang around between opening, pouring and drinking, but there was almost nothing there to smell and not much more to taste. But slowly it unfurled: three hours later it was good, the following night it was excellent, full of fruit but not at all overdone. I even – and I know this is no reason for buying a wine, and I should slap myself on the wrist just for thinking it – like the label. Presumably Jancis tried it at a press tasting, from a bottle that would have been opened some time earlier, but like her I think this is an extremely good buy at £7.50. More than twice the price but still worth recommending is Ogier’s La Rosine, a relatively cheap vin de pays from people better known for their Cote-Rotie. 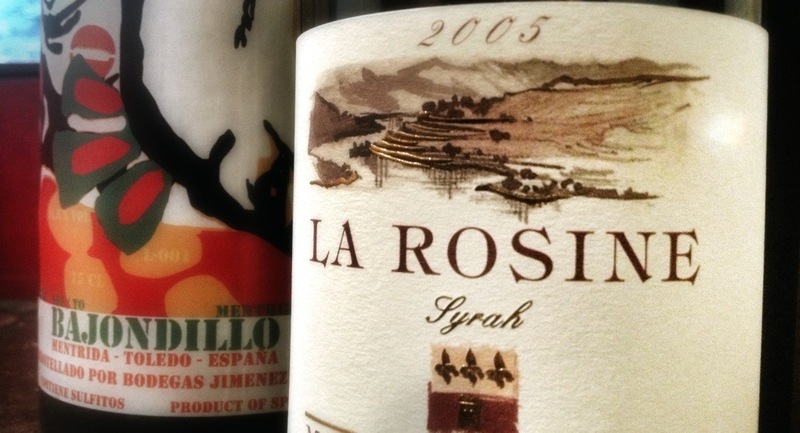 I’ve tried the 2005, the 2009 and the 2010 and they’re all great, particularly the latter. This is the 2005 and is close to being my perfect weekday wine, with that savoury, bloody, iodine* character that the northern Rhone does so well, but at an affordablish price (Berry Bros have the 2008 for £17.40, though I’m told it’s regularly available at their Basingstoke bargain retail outlet for around a tenner). In Hugh Johnson’s Pocket Wine Book (reviewed here) Ogier is allocated just a single word – oak – which I fear does them a disservice, though clearly they do keep the coopers busy. They’re good. Buy with confidence. * Who knows what iodine really tastes like? I’ve never slurped the stuff, but it’s one of those words used in wine reviews that refers to a particular flavour in wine that no other word refers to. I find these words amusing. Robert Parker does too, and I can tell because his reviews are totally stuffed with them. In a random selection of five Bordeaux reviews you are extremely likely to see more uses of the word “camphor” than non-Parker-readers happen upon in a lifetime. I reckon he chuckles every time he uses it. While I’m here, another tip, in the form of a restaurant that despite having relative novelty on its side, and getting some favourable reviews, was inexplicably empty. Sure, there’s mitigation – it was cold out, and it’s January, and it was a Monday – but that’s not a good sign. What was a good sign, though, was the quality of good food they proceeded to give me, and the manner in which they did it, and the wines I could choose to go with it. The menu in the evening offers no choice: you get four courses, it costs £35, and you’ll ruddy well like it. And you will ruddy well like it, stuffed as the little menu is with quality British ingredients, mostly prepared with skill and without fuss. The food wasn’t perfect – a fish soup was too peppery; there was a Jerusalem artichoke fritter that I wasn’t convinced by – but firstly the hits more than make up for the misses – perfectly cooked monkfish, amazing slow-cooked venison bites for starters, and as good a lamb rump as I’ve ever encountered – and secondly it is served with a spirit of generosity which is rarely encountered away from home, and which I find overwhelmingly pleasing. Things come on platters or in dishes or even tureens (full of custard, the best kind of tureen in my experience) for sharing among your party, bottles of still and sparkling water are handed over without prompt or charge, and they even offered us seconds (and not just of water). The wine list was interesting and the mark-ups not insane. Sure, it’s £35, which with service and half a bottle of wine means you’re unlikely to spend less than £50 on your dinner, but for what you get and the way that you get it I think it’s fabulous value and I’ll certainly be back (I just hope that they can fill enough uncomfortable pews to still be there when I do).